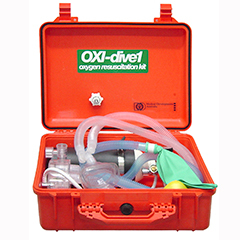 The OXI-Dive range of resuscitators is designed for use on dive boats. The resuscitator is packaged in a high impact chemical and water proof plastic case brightly colored for visibility. The OXI-Dive 1 is based on a closed circuit breathing system, so benefits from the special features of the closed circuit design (as explained for the OXI-SaverTM). The key benefit in the context of dive boats is the low flow of oxygen, which will maximise the duration of the oxygen cylinder. This is a key consideration for boats far out from land.